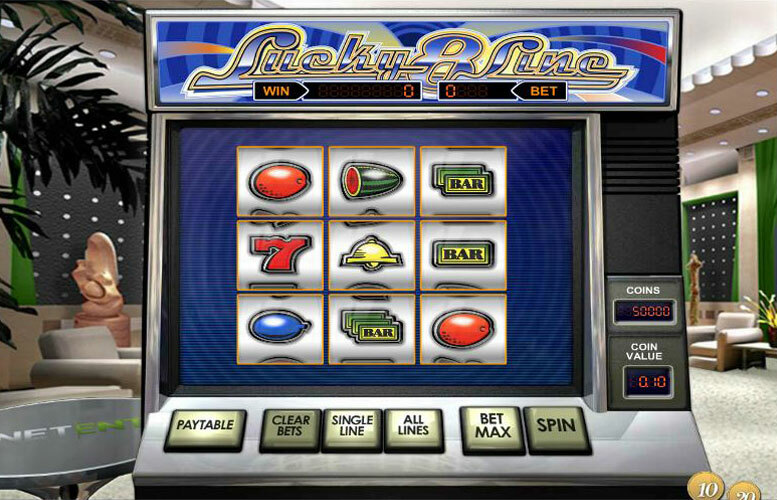 Forget crazy complicated video slots, take the Lucky 8 Line slot machine for a spin instead and bag yourself a 64,000 coin jackpot. With just 3 reels and 8 paylines this slot is easy to play, offers big cash prizes and is very much in the classic style! We like it, so will you. If you have become used to modern multi line 3d video slots you may find the Lucky Eight slot almost as if you are downsizing in your entertainment. On the other hand, if you have been mostly playing the classic three reel slots then you are going to find this one quite different and appealing. This slot is a 3 reel 8 line slot machine, so the overall reels take up less play area with a boxed effect, and it’s very much styled on a classic Vegas slot machine. The sound effects are certainly an acquired taste on this one but again are themed around the classic spinning of an old school slot game. Don’t let the smaller size of Lucky Eight Line fool you though, as when it comes to payouts it offers a hefty jackpot of 1000x your line bet with the right combination. Often people get confused with the payouts of slots thinking that their wins are in cash value when they are actually in coins. In this particular slot whatever you are betting per line you would multiply by 1000x if you happened to get 9 red 7s in one spin. Get this across all active paylines and you’ve hit the top jackpot. All of the payouts for Lucky Eight Line are paid out by multipliers of your line bet. Before we move onto what the other combinations can offer you first you need to know it’s the red 7’s that will produce the biggest wins for you. Aside from the 9 paying out the jackpot, there are other winning combinations with this symbol that will bring you some good profits as well; if you gather 8 of them you will receive 400x, 7 will give you 200x, 6 will give you 100x, 5 will pay out 50x, 4 will pay out 20x,3 will give you 5x, and finally even just getting two of these will give you 2x your line bet. Any slot machine would pretty boring if it only had one symbol that paid out, so there are a few others for you to watch out here during each of your spins. Something extra special that you want to strive for is a collection of all the same symbols in a spin and you will enjoy some extra special winnings as well. 3 triple bars will pay you 100x your line bet, get all of them and you will get 500x. A2 bar pays out 100x, and a collection of all of them will give you 400x. A1 bar will give you 30x. with a collection of all paying out 300x. If you roll 3 melons you can enjoy receiving 20x your line bet but collect them all and you will get 300x your bet. The bell with give you 18 x your line bet if you roll 3 of them and a full set of them will give you 200x. Grapes will pay out 14x line bet for 3 of them and the whole set will give you 100x. The orange will award you 10x your line bet for 3 of them, but for a full set of them you will get 50x. If you collect 3 bars of any combination. For example, you could have 2, 3 bar symbols and 1, 2 bar symbol, then you are paid 10x your line bet for your efforts. If you collect bars on all the pay lines you will get 50x. The cherry is one of the most common symbols to be found on any slot machine, and the Lucky Eight Line slot won’t disappoint you here. 3 cherries will pay you 10x your line bet, while a collection of 2 will pay out 5x and even 1 will give you a token of appreciation with a 2x line bet. Finally if you have all the pay lines filled with any type of fruits you will receive 15x. Now although you don’t have a lot of the features that come with many of the other NetEnt slot games you do have one that you can take advantage of here that will give you some control over the game. This is the skill stop feature. This means that once you have activated the spin with the spin button if you hit it again while the reels are spinning you can stop the spin. So if you think you are going to have more luck this way then give it a try. Also you have the auto play feature that you can use. With this you can select how may spins you want to make without having to hit the spin button each time. 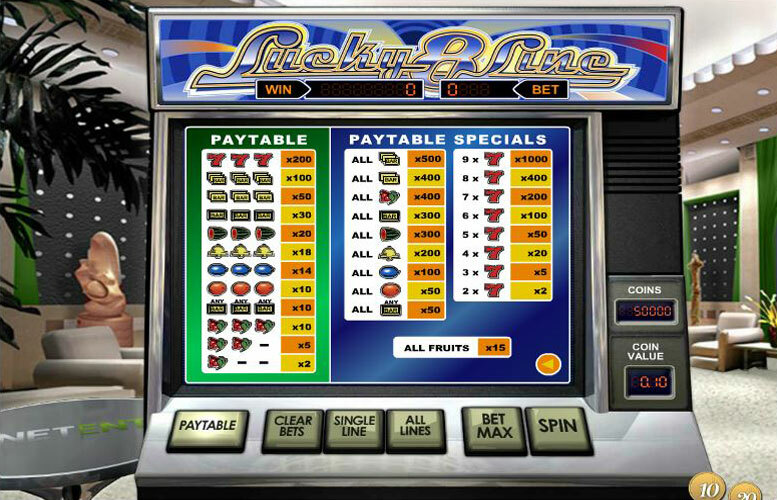 The Lucky Eight Line Slot has a betting range of 0.10 up to 0.20 per line and for each line you can bet up to 8 coins per line. Use caution here if you just decide to hit the max bet button because doing so will mean that you are betting 64 coins total for each spin. This game has a rating of 3 / 5 with 280 total reviews by the users.